The 'Dwarf Forest' the highest point on the East side of the park where the trees are much shorter than the surrounding canopy. A Bangor University student has just returned home from a six-week expedition to Honduras in Central America. 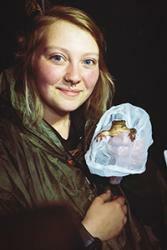 Molly Mannion, 20, from Bangor has just completed the second year of her four-year MZool Zoology with Herpetology degree. The former Ysgol Friars pupil had an opportunity to participate in the Operation Wallacea expedition as part of her undergraduate dissertation. Molly received a grant towards the expedition costs from the Dŵr Anafon charity. The expedition was based in Cusuco Nation Park, Honduras. The park has six open camps where Operation Wallacea work and conduct surveys on a variety of animals and habitats, including herpetofauna, bats, birds and invertebrates. The data collected in Honduras is currently being used to produce a portfolio to present to the National Forest Standard to apply for a grant to continue their effort in the National Park and help to prevent deforestation in the park. Molly MannionMolly explained: “I went to Honduras to complete my undergraduate dissertation on five species of Bolitoglossa salamander (Bolitoglossa conanti, B. dunni, B. dofleini, B. diaphora and B. nympha). My project was specifically looking at the ecology of the salamanders by establishing their habitat preferences. To do this I would survey most evenings, walking up to 600m down a transect trying to spot salamanders. Once a salamander was found, I would collect variables on its habitat like the type of perch it was found on, how high up from the ground it was, how far from water it was, how far from a tree, the depth of the surrounding leaf litter and the tree type it was found on. I also spent my time there surveying for a variety of herpetofauna such as anoles, snakes and frogs. “I have learnt a lot from my time in Honduras, particularly from the array of scientific staff who I was able to engage in scientific discussion which I felt has built on my knowledge base and has set me up well for my dissertation. “This experience has allowed me to complete an amazing piece of research on a group of animals I love, as well as confirming my interest in research and field work. It challenged me both mentally and physically, with the site being based in the true wilderness of jungle and terrain I have never come across. It was an unforgettable experience where I was able to meet some amazing people and explore amazing wildlife.